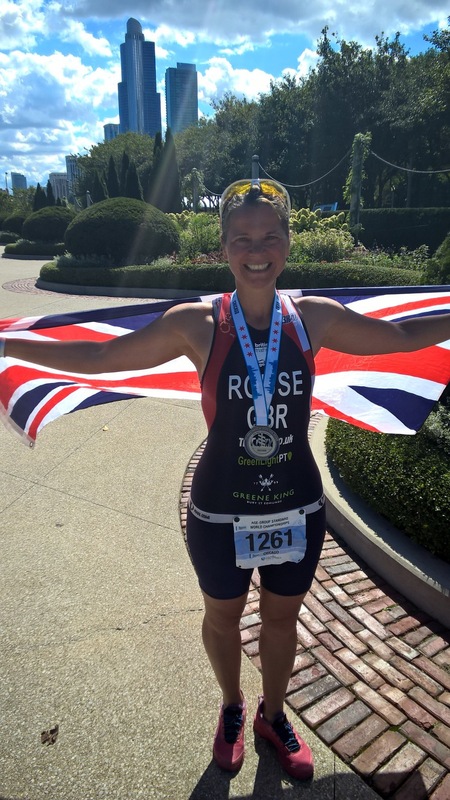 The goal has been achieved – I competed in the World Triathlon Championships – wow! Really does go to show that if you work hard towards your goals they are achievable. I’ve put a lot into making this happen through consistently training, working on improving my skills and my nutrition. We flew to Chicago on the Sunday as my first race was on Wednesday and I wanted to ensure that I’d acclimatised. We were allowed to swim in part of the swim course on Tuesday and jumping into Lake Michigan was a delight, it was fresh water, clear and a lovely temperature of around 17 degs and with the air temperature around 27 degs it was lovely and refreshing. The water was a lot choppier than I’d anticipated and it left me feeling a bit dizzy. The Aquathlon was Weds morning with my wave going off at 11:50am. With a deep water mass start, I chose the ‘racing line’ after making the mistake at Bala the previous week of starting too wide and adding on minutes to my swim. The start was fast and I decided to go with everyone knowing that it would calm down and I was also determined to give this my all. I tried to draft but just couldn’t find anyone suitable so settled into my own thing, I think I ended up leading the middle pack as my feet kept getting tapped (I didn’t mind, it meant I wasn’t last!) and a group of 4 ladies came past me with about 200 meters to go. I wasn’t going to let them get away though so worked hard to hang onto them. The swim exit was hard as we had to make a 90 deg turn and I got swept back by the current and missed the exit steps and had to work hard to swim around the correct side of the bouy. The run to transition was about 300 meters plus another 100 to my spot but it seemed to go without a hitch and 4 mins(!) later I was out on the run. By this point it was 30 degs but it didn’t bother me too much as I was still wet from the swim, it was only when I poured water from the aid station over my head that I realised how hot it was as the cold from the water took my breath away. I could see I was slowly catching the runners ahead but I just couldn’t close them down enough to overtake, the finish was great, on the blue carpet around Buckingham Fountain and past the grandstand. I felt like I’d had a good race! My times were slower than I expected but according to those with GPS the swim and run were both longer than expected. I placed 24th out of 34 in my Age Group and only 30 secs between me and 20th. This was my best placing in a Worlds or European Aquathlon so far. 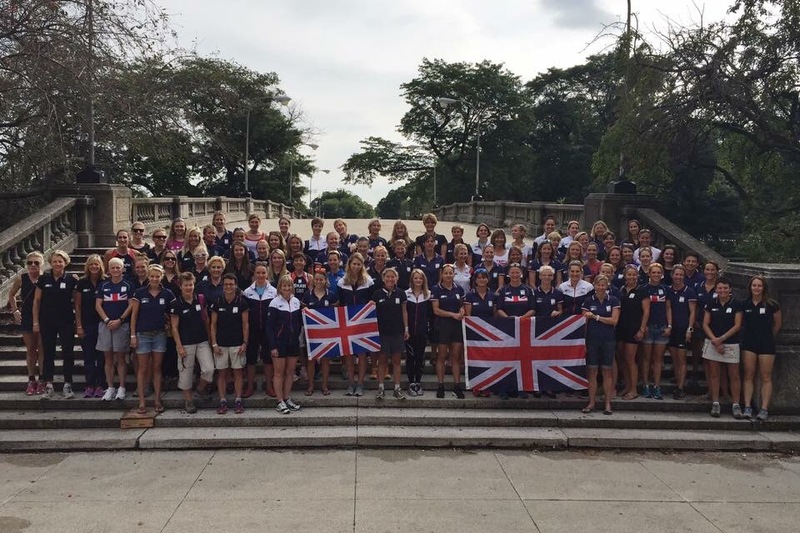 It was then a case of recovering for Saturdays race, fitting in some gentle training, attending the opening ceremony and race briefings and a bit of sight seeing. We were due to take our bikes to transition on Friday evening but Chicago was hit by a thunderstorm so the park was evacuated, watching the local news and seeing the tornado warning was interesting but I just had a feeling that everything would be ok for the race the next day. My race started at 11:11am and I felt relatively calm all morning until I was getting into my wetsuit when I suddenly wondered what on earth I was doing there!! I started off too far back in the swim but only because the race started just as I got to the start line. Like in the Aquathlon the start was fast but I held back a bit this time as it was twice the distance. My plan was to swim steady and strong until I got back to the pontoon at half way and then to go fast to the end. This seemed to work and I passed a number of swimmers in the 2nd half but wow it was hard work! The lake was choppy and full of debris from the storm and the last 200m seemed to take forever. Run to transition was the same as weds and I was soon out on my bike. The bike route was flat and fast with most of it being in underpasses in the dark. A 2 lap course, I loved it and even survived the 180deg turns without de cleating!! T2 was smooth and I hit the run and this is where I didn’t do so well. My plan was to take the first 2 laps steady then pick it up for the last 5k but I really struggled with stitch and every time I tried to up my pace it got worse and I had to ease back. I also took the decision to stop and drink water at each aid station as I had witnessed lots of athletes collapsing from the heat and didn’t want to join them. I put everything I had into the last 1k but my legs didn’t want to go any quicker – I crossed the finish line knowing I had given it my all on the day so no regrets. I finished 61st out of 82 in my Age Group, convinced that I’d come last I was really pleased to see I didn’t embarrass myself – phew! This was my first time racing triathlon at this level and given that it was my 4th race at this distance, a distance which I wasn’t even training for, I am proud of what I achieved and know that it’s just the start and I’ll get better. So, that’s it. Job done. Time to have a rest from racing and look forward to some winter training. I hope you’ve enjoyed sharing this achievement with me and thanks to everyone for your kind wishes and support. Massive thanks to all those people who’ve helped me out. Mark for supporting me with my training, driving me across the UK to races and coming to Chicago with me – it’s a good job he loves me!! Adam at GreenlightPT for the coaching, answering my endless questions and believing in me when I announced that I wanted to qualify for the Worlds. I’ve also had support with gear from David at Tri Crazy, Jamie and Max at Multisport distribution. Mike at Velomotion for the bike fit and lending me his bike box. Alex at Insight Nutrition for the advice and supporting my sudden change in racing distance. Time always seems to fly by in the summer and I am only four weeks away from competing in the World Championships which will also mark the end of this year’s triathlon season. So, what have I been up to over the last two months since competing in Cologne – training, training and more training and a few ‘fun’ races thrown in. 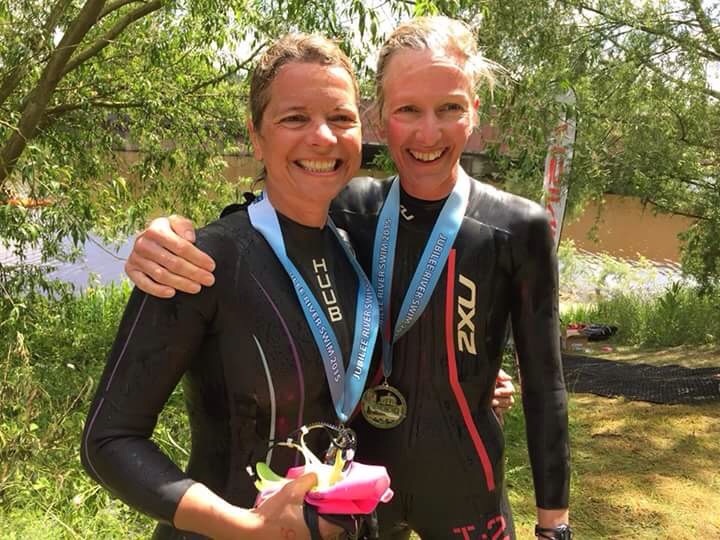 The first of these was the inaugural ‘Isoman Triathlon’ – a different format of triathlon where all three disciplines are equalized, so in theory you spend an equal amount of time swimming, cycling and running. I entered this race at the beginning of the year as I thought it would play to my strengths of consistency and being relatively ‘average’ in the three areas. Turns out the format worked and all of my splits were within 1one minute of each other which earnt me the title of ‘most equal’ athlete over my race distance and I also gained the fastest bike split (female) – there were awards for the fastest on each split at this event as opposed to overall as you could choose any combination of the sports, so I was also competing against people doing just one discipline. I finished in a healthy fourth position and second female vet. It was an interesting and quite relaxed event which I enjoyed as a training race but I don’t think I’ll be back next year as the course wasn’t very inspiring and I’ve done more enjoyable races. At the end of July we ventured over to Snowdon, this time for Mark to compete. He took place in the inaugural Snowdon Trail Marathon (a thoughtful Christmas gift from his wife! ), which turned out to be a 29 mile run – a really tough event in horrible wet weather and the ascent to Snowdon Peak didn’t even begin until mile 21! I saw Mark off at the start and then walked up Snowdon with Oakley with every intention of getting the train back down as it was a bit too far for a 12 month old puppy and my bad knees. Unfortunately the train wasn’t actually running to the top as the weather was so bad, so we ended up having to walk back down too. Needless to say we had one very tired puppy afterwards. Mark did so well completing this marathon and even set his own record of only falling over once (in the last mile! ), I was so proud to see him finish. Earlier this month I went along to a bike race training session for beginners at the MK Bowl with the intention of developing some bike skills, especially as I am rubbish at cornering and group riding. It was a great morning and my objectives were achieved, I also found out how far I still have to go with my cycling if I compare myself to cyclists rather than triathletes – we had a mock race at the end of the session and I got dropped so quickly it was embarrassing, coming in a very lonely last place. Oh well, I can only improve from there! 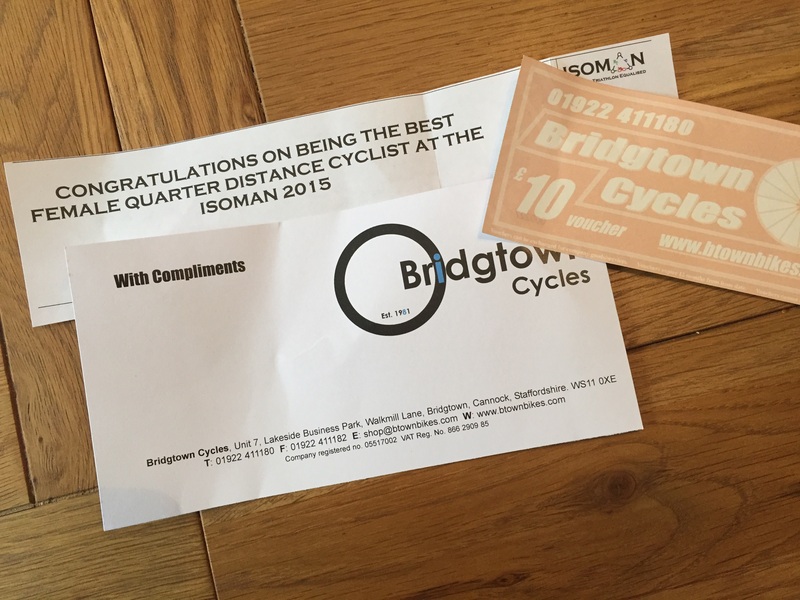 This year seems to be a year of ‘firsts’ – I have also ticked off my first cycling Time Trial event this month, something that I have been meaning to do all year but just never got round to it with all my race focus. This was a 10 mile course and I loved every minute of it, I will definitely be back to do more next year and this year if I can squeeze them in before the end of the season. 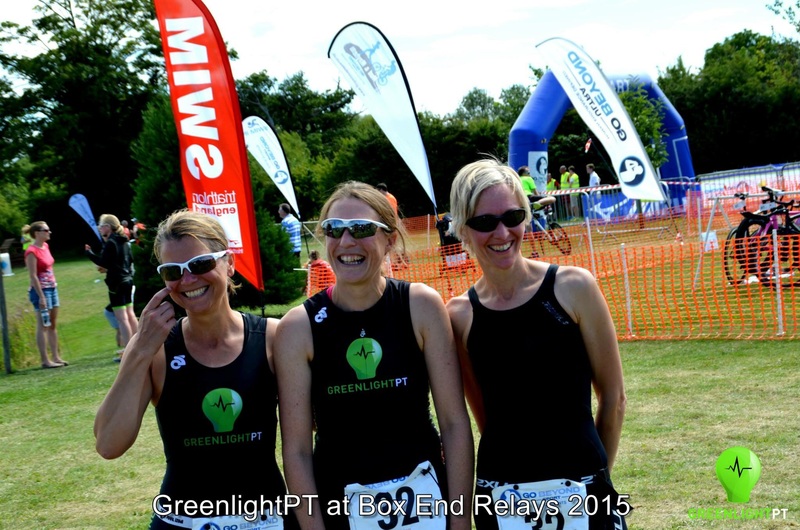 Two weeks ago I competed in the Regional Team Triathlon Relay at Box End. 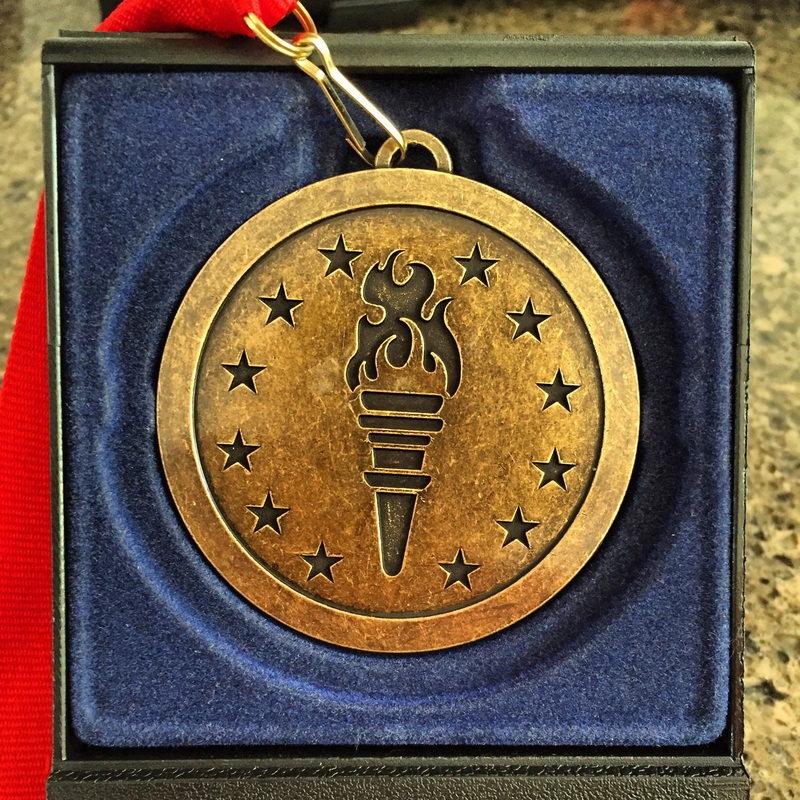 A fun event for the Club, which saw GreenlightPT enter an impressive eight teams. I was a part of the Green Goddesses (we all had to have the word ‘Green’ in our team names) with Nicole and Jo, on paper a strong team of ‘veteran’ ladies! 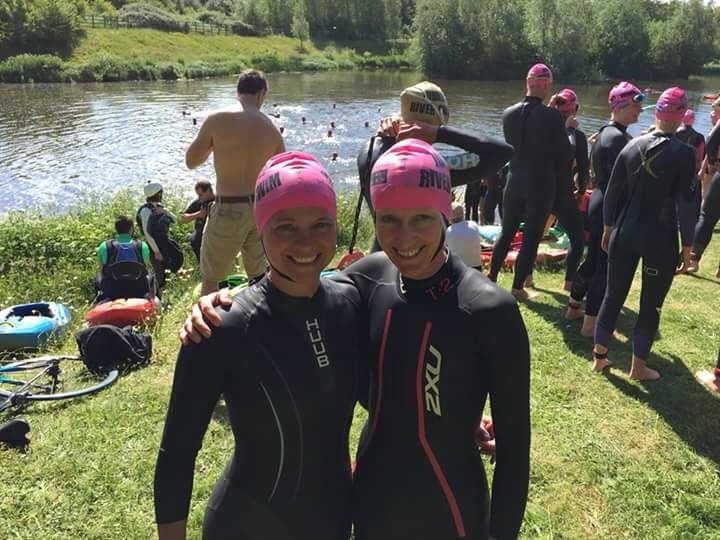 The format was that we each took turns to swim, bike and run, so unlike other triathlons we had a break between each split. We were blessed with great weather and it was a great team event. To top it off the Green Goddesses won the Bronze medal at the event – not bad for a team of oldies! Adam and his team also got a silver medal, with all the other GLPT teams doing brilliantly too. I think we will all be back next year. 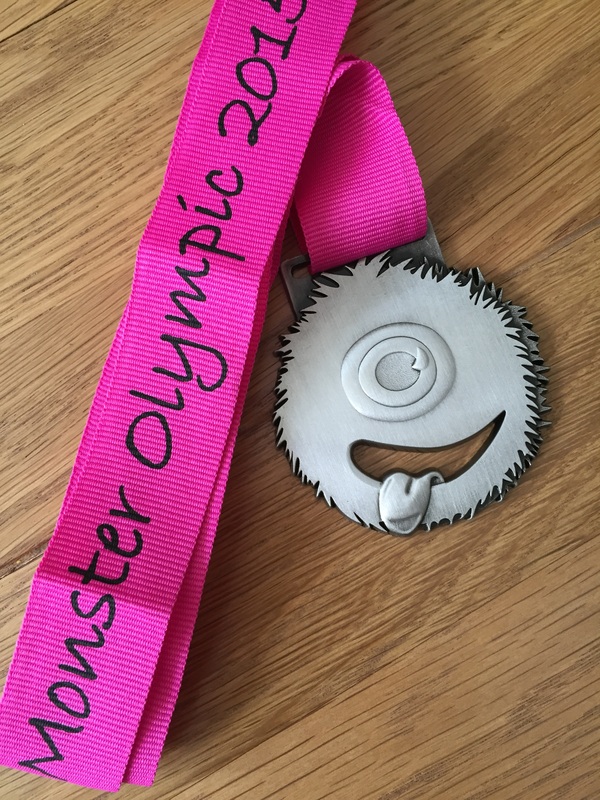 Then finally last Sunday I took part in the ‘Monster Olympic Triathlon’ in Ely. I decided that I needed a bit more practice at racing this distance before Chicago so looked for a race which would fall within the right timeframes. It turned out to be longer than a traditional Olympic distance triathlon with a longer bike of 44k and longer run of 12k. I did some rough calculations as to how long it should take me to complete the distance and guessed around three hours based on recent results. I had a quick look at last year’s results to see how this faired and saw that it would place me in the top three females last year so then thought maybe that time was a tad ambitious, especially given that I would be racing tired after no taper for the event. An early start of 7:30am and we were off for a 1.5k swim up and down the river. I was racing with the men in the same wave too so I decided to hang back a bit at the start with the aim to start off steady and then build, as from previous experience the men have a tendency to go off like rockets at the start and take no prisoners. This tactic seemed to work and I was able to spend half the race drafting and the other half over taking people. I could see I wasn’t far off the race leaders at the turn around point and put in an extra spurt, however I found myself constantly drifting across the river with the current and had to work hard to stay in a straight line to head for swim exit. The bike was flat and fast apart from a few sections which were described as ‘rural’ roads, bone shakers more like! The run was almost three laps of the city taking in the grounds of the Cathedral and the cobbled High Street. I really struggled to begin with and just focused on keeping going, trying to not let too many people overtake me – why do other runners always make it look so effortless? Suddenly with one lap to go (about 3k), I found my running form, I’ve no idea where it came from or why it took so long to find me but I suddenly felt very spritely and almost sprinted from then on, I was about 1k from the finish when I looked at my watch and saw it said 2hrs 54mins ish and quickly calculated that if I gave it my all I had a chance to reach the 3hr target, I sprinted like mad (luckily it was mainly downhill then!) and was delighted to cross the finish line in 2:59:32. Unfortunately not a winning time this year but I did finish 7th female and was 2nd in the 35-44 age category for the race. I had been managing my training with very sore knees the last few weeks and unfortunately this race finished off my left knee so I’ve now to rest for a few days whilst it heals itself, fingers crossed it’s not too long as typically I am actually feeling really well after the race and ready to hit my last block of training before Chicago – everyone keep their fingers crossed for me that my body can hold itself together until then!